Marine le Pen inaugurates her presidential campaign in Paris, November 16, 2016.Christophe Ena/Press Association. All rights reserved.As I was teaching in the US this autumn term both during and after the presidential elections, all my friends, students and colleagues would sooner or later ask me the same question: who is next? 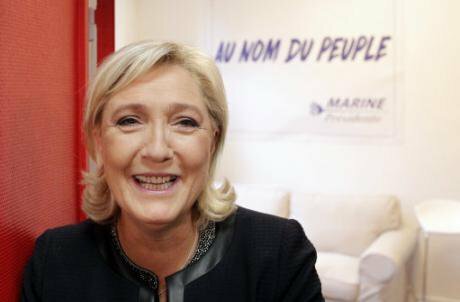 Do you think that Le Pen will win the French election in May? Deploying various scenarios stretching from a kind of domino theory whereby each “liberal government” that crashes destabilizes the next one, to a contagion spread by the ruin of the distributive social policies that are universally targeted by neoliberalism, they tended to view Brexit as a prefiguration of the new “surprise” result. Clinton’s defeat together with Renzi’s fall and Hollande’s defection became aspects of the same disaggregation of the “center left”. The defeat of the neo-fascist right in the Austrian presidential election appeared as a brief respite, and Poland’s civic demonstrations against the Kaczynski regime, a fragile element of resistance. The strategic question (this was before the recent murder rampage in Berlin) would be: will Merkel “stand her ground” before the offensive of the xenophobic alliance attacking her opening of the borders for the Syrian refugees last year (“Wir schaffen das”)? Returning to Europe, I can see that the same questions are in dispute on this side of the Atlantic as well. And the category around which analyses or speculations revolve is always “populism”, with its deep ambivalence and its range of antithetic applications. I agree that Europe (meaning in practice the European Union, of which, note well, the UK is still a member, albeit with diminished prerogatives in anticipation of Brexit, should it ever take place) and the United States are holding up a revelatory mirror to each other. The differences are obvious, and they are well-known. But, yes, the two situations interact, and they shed light on one another, which may help us grasp the deep crisis of the political institution now running on both sides of the Atlantic, to identify its key points of contact, avoiding empty generalities as well as myopic localism. This makes sense, in particular, because on the European side the strategic level is decidedly a continental one: the increasing paralysis of parliamentary systems, the ungovernability affecting one nation after the other (Britain, Spain, Italy, France…), which makes them easy prey for demagogic nationalistic discourse, must be seen in good part as a direct consequence or collateral damage of the collapse of the European project as a credible political and cultural trajectory. On the American side, the declining power of the “empire” is now shaking not only the “social compact” to which it once gave an economic and patriotic basis, but also its constitutional edifice, despite its forming one of the oldest republican regimes in the world, with a remarkable system of “checks and balances” allowing for its stabilization in times of internal tension. 1) The lesson of Clinton’s defeat (which was essentially her incapacity to overcome the rhetoric and the tricks of her opponent which gave him the lead in crucial “popular” swing states, since, as we know, she won the national vote by a considerable margin) is the following: it is both absurd and a sure recipe for disaster to try and neutralize the political, in the line of post-democratic governance now hegemonic in our bi-partisan parliamentary systems, through a camouflage of the deep divisions within our societies that neoliberalism has either intensified or generated: class divisions (including increasing economic and educational inequalities), ethnic and racial divisions (frequently combined with religious discriminations), moral divisions (particularly in the realm of family values and sexual norms). Add to this a high level of structural violence: economic, judiciary, domestic, urban, that Clinton never mentioned (except, to some extent, in the form of sexism), and that Trump managed to appropriate under the terminology of “anger”. 2) The lesson arising from the comparison of the two campaigns led by Trump and Bernie Sanders respectively, often presented by liberal analysts (e.g. in the New York Times) as “symmetric” movements of rejection of the elite, is the following: henceforth and forever we must stop using the category “populism” in a manner that bridges the chasm between left and right. This is especially important from a European point of view, since the word “populism” has a distinct history and a partially different semantic distribution in the US (where a typical “populist” at this moment in time would be Elizabeth Warren, a very rational and well-established senator…). That there exists a crisis of the “system”, both in terms of its legitimacy and in terms of its representative capacity, is no longer just an opinion or a political doctrine, but an objective fact. However, the conclusions that are deduced from this pull in radically opposing directions: either a xenophobic nationalism (which tends to be combined with protectionism, through the lens of migratory politics and the “closing” of borders), or a quest for the “missing people” (Deleuze’s expression), a new synthesis of resistances and democratic hopes involving a plurality of cultures and social forces. But, despite certain possibilities for amalgamation in the political game (sometimes referred to in Europe as a “red-brown” alliance, of the kind that there seems to be an attempt to construct in certain regions of Austria today, with similar temptations arising in Germany and in France), there is in fact no middle ground. 3) The third lesson, it seems to me, is the following: undoubtedly institutional models rooted in different histories determine different conditions for political action, both parliamentary and extra-parliamentary. This is true when comparing the US to its European counterpart, and it is true within European “pseudo-federalism”, among the historic nations themselves. This difference, however, should not obfuscate the fact that in both regions of the world (the two regions where the “bourgeois” democratic model was invented in the nineteenth century, later having to become adapted to the rise of emancipatory movements and the counter-effect of social struggles), the same constitutional problem is now emerging. This is a general problem of our time (which does also exist, of course, in other parts of the world: Latin America, India, South Africa immediately come to mind as meaningful points of comparison, whereas the case of post-communist regimes in China or Russia seems to obey a different logic), whose content is a brutal oscillation between the seemingly irreversible process of “de-democratization”, and the possibility of a “democratization of democracy” itself. We begin to see what mixture of depoliticization (with its institutionalized corporate lobbying and subjection of “representative government” to technocratic instances) and permanent “state of emergency” or the security-state is involved in the process of de-democratization. We understand conversely that the idea of “democratizing democracy” should begin by curbing the power of money in politics, reversing the technocratic monopoly over public judgment, and limiting the privileges of cultural or material heritage. This is a genuine regime change that seeks to make room for a direct participation of citizens in public affairs: an exigency now widely perceptible in all our constituencies. It is, put simply, synonymous with active citizenship, but at the risk (which must be consciously run and controlled) of bringing back “civil conflict” between parties or antagonistic world-views, thus subverting ossified political systems which appear obsessed with “normality” and “consensus”, while in fact targeting their dissidents with extreme intolerance. At a more general level, while comparisons with the world-crisis of the 1930’s are at the same time useful and partially inadequate, we understand that radical choices between social models and values are now (again) becoming hazardous, because the “global” stakes that are reflected locally contaminate each other in a negative manner: as it were they produce conditions of impossibility for any rational examination of their causes and effects. This is true of the way in which global warming has now passed the threshold of irreversibility in changing the environment, threatening whole groups of the human population (among other species) with a destruction of their lifeworld, potentially forcing them to flee or perish in a predictable future. It is true for the deregulation of financial capitalism, now dominated by the new gold rush, the rush for liquid assets – whose reverse side, however, is an exponential development of human precariousness, whether nomadic or sedentary, that Saskia Sassen has adequately called generalised "expulsion". And it is true for the “clash of civilizations”, a murderous self-fulfilling fantasy with a real basis nonetheless, which is the new regime of international migrations and the concomitant hybridization of traditional cultures. Where these phenomena intersect and overdetermine each other, extreme violence is looming. And it rages actually wherever the flames are fanned by dreams of lost empire, conflicts of secular and religious “monotheisms”, the massive trade of arms and the thirst for oil (or, in the French case, uranium), the combination of real and imaginary security threats under the name of “terror”. With respect to such global challenges, more or less perceived by the masses, what we can observe daily is the fact that so-called “sovereign” entities (nation-states, however big, supranational federations and alliances, international organizations) are largely ineffective if not detrimental. It is this “powerlessness of the omnipotent” (an expression I used in the past to explain the roots of neofascist xenophobia among “petty-white” citizens who try to forget their own social downgrading in calling for the visible discrimination of the Other by “their” States) that generates collective resentments and panics, on which “populists” are riding, but which can also escape their control or push them towards some sort of dictatorship. On the other hand, we discover with hope and admiration the energy for a renovation of democracy in “assembly” movements like Indignados, the Arab Springs (which also had other dimensions), Occupy Wall Street, Syntagma Square, Gezi Park, Nuit Debout… which in the recent period have truly resurrected the idea of a people both deliberative and active. But we are desperate to see how disarmed they remain before the accumulated and concentrated power of the oligarchy, when it comes to bringing about institutional and policy change. Something more is clearly needed. Otherwise, the pendulum will shift in the opposite direction in the most brutal manner. Already Trump (who was elected on a “populist” agenda) is orchestrating the clamorous revenge of Wall Street over the “occupy” movement that, obviously, keeps haunting its CEOs. In Erdogan’s Turkey (not to mention the broader Middle East) a “counter-coup” brutally crushes democracy and individual liberties. And everywhere in Europe politicians from left to right compete for the trophy of intolerance. Are we then entering the long night of subjection and anti-politics? There is no way however that national-populism can offer solutions to the radical challenges of the day or satisfy the basic demands of the popular majority (made of multiple “minorities”), whether this concerns the protection of populations and their ways of life; or the necessity of regulating the global movements of capitals, goods, and persons; or the articulation of participation with representation within a new form of citizenship that is adapted to the age of multiculturalism and internet communications. Instead, the fundamental question of the place (and the “places”, or “squares”) for living, working, learning, meeting, thinking, struggling in common, that must be created for all citizens, becomes reduced to imaginary and discriminatory scenarios. Inexorably, under the Trump presidency or any of his potential European imitators, this will produce more resentment and feelings of insecurity, thus an increased tendency to divert them aggressively towards scapegoats and “internal enemies”. For this reason, but first to counteract as much as we can the devastating effects of national-populisms which are on the rise in one country after another, we must imagine a transnational counter-populism, ceaselessly working to invent its political language and promote its ideals. Tentatively, speaking in Athens in 2010, I had given this oxymoronic name to the diverse resistances against austerity policies in Europe, in full awareness that it offered neither a program nor a solution to the institutional and social crisis opening up before us at the hands of the EU itself, when it decided to destroy one of its own member states in the name of financial rules devised by the banks and for the banks, and inscribed in the treatises that function as substitutes for a European constitution. It was (and remains) just a name to indicate that we need a concentration of forces and an assemblage of ideas to recreate a politics made by the people and for the people. With populism, “counter-populism” shares a formal characteristic: criticizing the dispossession or disempowerment of the masses in the oligarchic regime. Against populism, it doesn’t confer the task of ending dispossession to the dispossessors themselves, but seeks and requires the empowerment of the citizenry, therefore pushing its capacity beyond the limits and across the borders that in the past defined the political. A shorter version of this article has been published by Il Manifesto, Rome (30 December 2016) and Libération, Paris (3 January 2017).